The latest fight for net neutrality has officially begun. On one side of the ring stands FCC Chairman Ajit Pai, a Trump appointee who controls a majority of votes for any decisions currently made by the Federal Communications Commission. He's backed by the three major companies that deliver Internet services in America: AT&T, Comcast and Verizon. Facing them off on the other side stands a self-described "ragtag" coalition of web content providers — some 70,000 at last count — who are declaring the "last stand" for net neutrality. As people go online today, they'll be alerted by prominent messages on sites as varied as Google, Facebook, Amazon, Airbnb, Netflix, Kickstarter, Dropbox, the American Library Association, Green Peace and Chess.com warning against "big ISPs" that plan a future filled with "traffic throttling, site blocking and new fees." Later this summer, the FCC is expected to schedule a final vote on its planned changes to the net neutrality rules. In May the agency requested feedback on its proposed rulemaking, which it titled with the positive-sounding, "Restoring Internet Freedom for All Americans." At its heart is a proposal to reverse a 2015 rule that classified the internet as a utility. So far, 6 million comments have been sent to the FCC, nearly 75,000 per day since the proposed changes were first taken up by Pai. 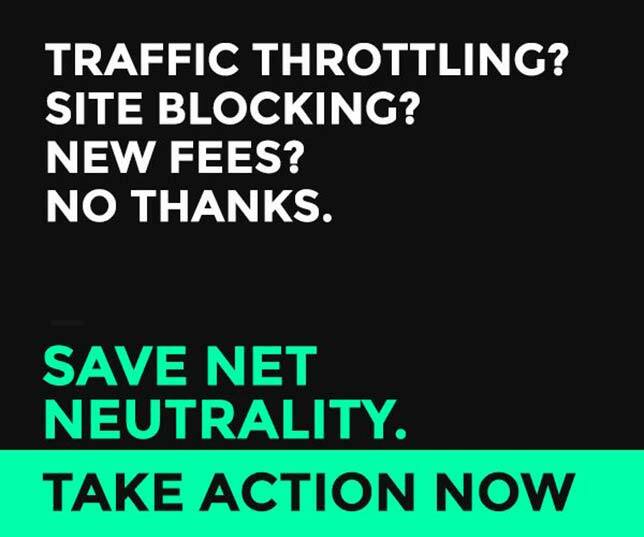 One of the banners that will appear on sites today in support of net neutrality. MapLight said the stakes for the three telecom companies and its public voice, the National Cable TV & Telecommunications Association, are high. Since 2008 they've poured an estimated $572 million into lobbying the federal government for favorable regulations, a tally that equates to spending the equivalent of almost $100 for every one of those net neutrality comments. Many of those public statements, however, are being generated automatically, as PC Magazine reported last month. On the side of sticking with the current rules are filings that begin, "I don't want [internet service providers] to have the power to block websites, slow them down, give some sites an advantage over others or split the Internet into 'fast lanes' for companies that pay and 'slow lanes' for the rest. Now is not the time to let giant ISPs censor what we see and do online." Many of the comments from those who support the proposed changes use this text: "The unprecedented regulatory power the Obama Administration imposed on the internet is smothering innovation, damaging the American economy and obstructing job creation. I urge the Federal Communications Commission to end the bureaucratic regulatory overreach of the internet known as Title II and restore the bipartisan light-touch regulatory consensus that enabled the internet to flourish for more than 20 years. The plan currently under consideration at the FCC to repeal Obama's Title II power grab is a positive step forward and will help to promote a truly free and open internet for everyone." While the origin of the identical comments being posted is unknown, one phrase has become a watchword for those who want changes made: "light touch." In a February speech, Pai used the phrase, "returning to the light-touch approach to regulation." And an FCC webpage explaining the initiative uses a similar expression: "The FCC has proposed to return the U.S. to the bipartisan, light-touch regulatory framework under which a free and open Internet flourished for almost 20 years." Those participating in today's online protest, however, aren't buying the official messaging. According to Evan Greer, campaign director for the Fight for the Future, which is leading the "Internet-Wide Day of Action to Save Net Neutrality," the action is intended to "fight tooth and nail" to keep the current net neutrality protections in place. "Politicians in Washington, D.C. need to learn that net neutrality is not a partisan issue and Internet users will not tolerate these attacks on our basic rights — we will come together to protect the web as an open platform for free expression and exchange of ideas," he said in a prepared statement. "The Internet has given more people a voice than ever before, and we're not going to let the FCC take that power away from us." The comment period will remain open until Aug. 16.